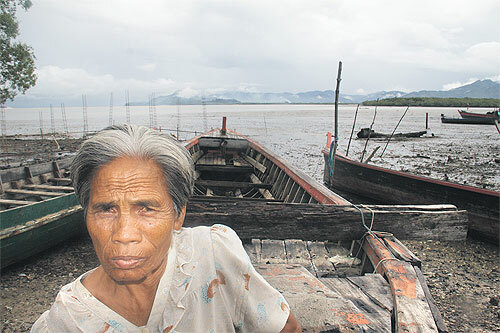 Village elder and midwife Liya Pramongkit, skin brown and furrowed as a walnut, spent her early life living as a nomad aboard handcrafted wooden boats called kabang. They were fashioned from giant rainforest logs; planking held together with vines. Moken elder and midwife Liya Pramongkit recalls the former ancient way of life on the sea in the small kabang boats. The kabang symbolised the human form and elements of the boat were named after body parts such as the stomach and ribs. All around them were the spirits of the sea. Whole families once lived on kabang, often for months at a time. A thatched roof would provide only partial protection from the weather. Ms Liya still sings a fittingly haunting Moken lullaby about a hungry child. So many Moken children have gone hungry, not least in recent years, as their parents' subsistence way of life has ebbed away. There was the devastating 2004 tsunami, greater enforcement of the arbitrary maritime Myanmar "border" with Thailand and the commercial depletion of marine life. Many children have died from malnutrition and disease. If there are sea spirits watching over the Moken, they must be weeping. 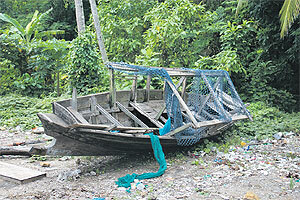 WRECK OF THE PAST: An old ‘kabang’ boat lies rotting on a Koh Lau beach. There are plans to bring back old men who can still build these vessels and even larger versions of them. "All the children you see around here, I helped their mothers give birth," says Ms Liya, who thinks she is in her late sixties. "If they study, they will be good people in the future. Moken children before did not go to school. And girls still often start having babies when they are aged only 12 or 13. A lot of the women here look older than they are." Ms Liya had six children, but three died between the ages of 10 and 12 without diagnosis or treatment. Rather than criss-crossing the Andaman Sea, navigating by the stars and a knowledge of currents, this group of several hundred Moken cling like barnacles to the small island of Koh Lao, despite their lack of Thai citizenship. The forested island is 40 minutes by motorboat from the port of Ranong, where the labour force is overwhelmingly comprised of workers from Myanmar. On Ranong's picturesque wharf, large though still rustic-looking, commercial fishing vessels are provisioned for voyages to as far away as India. These days, Moken men help crew these boats, their own small wooden vessels destroyed by the 2004 tsunami. Many men are away now, but monsoonal weather will soon force most of them home. Women sit under shanty houses on stilts, playing cards; gambling; some drinking heavily. Dogs abound. Between rows of ramshackle houses, there is a fetid miasma of plastic bags and other rubbish. There was little rubbish to dispose of when people were living according to traditional ways and and new practices in a sedentary alien environment are hard to grasp. 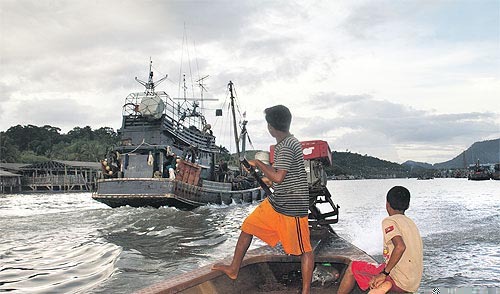 When the sea "went out" suddenly at Koh Lao and elsewhere in the region on Dec 26, 2004, old Moken knew what was coming. They headed for the hills and survived. On some of the bigger tourist islands, there were documented cases of sea gypsies warning Thais and foreigners that a tsunami was coming. That brought a certain amount of interest and sympathy from outsiders, but curiosity about the profound links between the Moken and their saltwater domain soon faded. The tsunami did more than destroy Moken boats. Christian groups came in search of converts among a people previously ignored. There are tales of missionaries telling Moken they would have to "pray to God" to receive clothes, boats and food. The Moken elders of Koh Lao were relieved when the Catholic Mercy Centre from Bangkok's Klong Toey slums, headed by Father Joe Maier, arrived four years ago and took a more culturally sensitive approach while providing a makeshift school, healthier food and assistance with medical care. "There is always tomorrow, isn't there?" Fr Maier said. "If we can keep the language alive and the culture alive and their great belief in the spirits of the sea, and their great respect for the oceans, then there is hope." In the village, there is a modest general store run by a Thai woman, Nawanit Jampit, 47, a Koh Lao native. She complains that much post-tsunami official assistance was inappropriate or marred by corruption. Moken said steel hulled boats given to them could not be taken out to sea and promptly sold them. Funding arrangements just resulted in more low-standard housing. "Sometimes the government assist Moken, but what they give melts like ice-cream in the sun," she said. "Those giving the aid just take pictures so they can put them on their websites." Some NGOs had done the same thing. Mrs Nawanit did a drawing of a person representing certain NGOs with a fishing line and a Moken figure on the hook as bait to attract donors. She believes that education could give children a weapon to defend their interests in wider Thai society. "Uncle" Sri-dhit does not look like a master bomber. But visitors are assured that he is an expert at rigging explosive charges. Bare chested and grey haired, but lithe and muscular for an elderly man, you may want to avoid Uncle Sri-dhit during one of his regular drinking bouts. 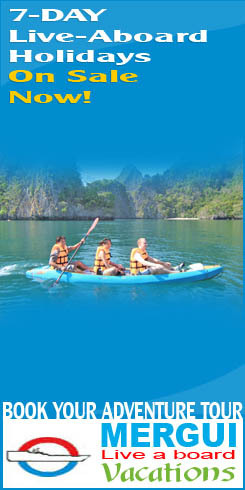 However, he is widely known for having a deep understanding of the Andaman Sea and its ways. Life has been hard. One of the seaman's sons was left crippled by severe decompression sickness, a curse among the remaining Moken deep divers. In Ranong, with its Tesco shopping complex, omnipresent ATMs, plush hotels and discos, as well the grime of a working port and smuggling centre, fortunes are made in the big business of seafood. From jellyfish to squid and crustaceans, it is a trade that flourishes. The delicious produce can turn up in Taiwan, Korea, Singapore or Hong Kong in up-market restaurants charging what for the Moken would represent earnings from many gruelling weeks at sea. Some scoff at perceived Moken backwardness, but they are more than happy to squeeze a tidy profit from the sea gypsies. Chinese, Thai and Indian entrepreneurs are known to directly finance environmentally damaging Moken explosive fishing. Coral reefs that have long sustained the Moken are destroyed in the process. Even the money the Moken do get is not always wisely spent. Much of their modest pay can quickly be blown on drink and gambling rather than supporting their families. As well as fishing with explosives there is deep-diving for sea cucumbers, also known as trepang, in various locations when the water is clear. This involves pumping air down a rubber hose to the face mask of a diver on the sea floor. This has been going on recently on reefs around another island, Koh Tao. While some divers drown, others get the decompression sickness and are permanently disabled _ the fate that befell Uncle Sri-dhit's luckless son. Then there are the injuries and deaths from the explosions and Moken from Koh Lao have been jailed for up to two years at a time, including for alleged explosive fishing in Myanmar territory. Others are detained just for being suspected "Thai" Moken. There have been reports of Myanmar soldiers cutting hoses while divers are on the sea floor or shooting Moken regarded as interlopers. Sometimes the Moken of Koh Lao take women and children with them fishing in Myanmar waters so they can pass as members of local Moken communities over the border who are officially called various permutations of the word Salon. The creation of marine parks and areas reserved for tourism on both sides of the border also contributes to the erosion of the Moken way of life. Around Southeast Asia _ including Malaysia, Indonesia and the Philippines _ there are tens of thousands of people going by tags such as Badjau or Orang Laot, widely characterised by the generic term ''sea gypsies''. While there are similarities of lifestyle, there are wide gaps in language and ethnicity. 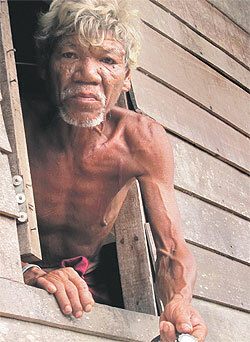 Sea gypsies are generally seen as coming from Malaysia after originally leaving mainland China thousands of years ago. The loss of a cultural foundation is a common problem throughout disparate sea gypsy communities. Pockets remain where more, rather than less, of the old practices are retained, notably in parts of the Mergui Archipelago extending through Myanmar waters. And therein lies cause for a little optimism. A cultural revival could help stem the sort of social problems evidenced by an incident during Fr Maier's recent visit to Koh Lao. Villagers carried a heavily inebriated, stocky young woman with bruising and a serious cut just below one eye into the Mercy Centre-run schoolroom. There had been an altercation involving her ex-husband's new wife. Tensions seemed to have been building for some time. The injured woman had just visited one of her seriously ill children in a Ranong hospital. ''She was beaten with a tree branch,'' an onlooker at the school said. Others said violence was a serious problem in the village and that alcohol was typically a factor. Broken glass from hurled empty beer and spirits bottles along the rocky shoreline starkly underscores the extent of the problem. But young women digging for shellfish at twilight at low tide shows a happier, gentler side of the Moken. There is a small island near Koh Lao where Moken from the area have long buried their dead. ''Now it is full and we bury our dead near the school,'' one Moken elder said. Time-honoured resourcefulness and survival skills have so far managed to keep these Moken from cultural extinction. Portents, though, are not good. Moken children were once renowned for their ability to see underwater without wearing a mask, able to spot and catch even tiny marine creatures. They can still do that in some places, but such skills are dwindling. Adult men, in turn, were held in awe for being able to stride along the seabed without weights for several minutes, underwater hunters with homemade spear-guns. So, it is a great irony that outside volunteers are now helping to teach some of the Moken children on Koh Lao how to swim. She mourned the loss of powerful spirit masters. ''We don't have shamans any more,'' she whispered. "The Moken children did not get vaccines and when I came here and they were very malnourished. They just drank canned condensed milk, not proper formula. Many still have weak immune systems and sometimes the mothers don't take care of themselves when they are pregnant. "In the first year I was here, every month about three children died [mostly] because of diarrhoea. Much of the water here, including the underground water, is not safe. To change things we have to teach the children about hygiene. Most people here don't know about disease and why they die. But now [fewer] children are dying because they have food, medicine and greater access to clean water." Every few months the children are given medicine for intestinal worms. Staff, though, still regularly extract worms from students and toddlers, the parasites smaller these days than the one-metre monsters encountered previously. The normal diet had been too heavily weighted to raw shellfish. Now a free lunch is provided at the school including meat, fresh vegetables and fruit. Leftovers are sent home with the kids. "When we came, there was a big problem with malaria," Ms Phakaporn said. "Right now one child has dengue. We are taking this child to a hospital in Rayong." Moken children with Father Joe Maier and a Thai teacher at a school funded by the Mercy Centre on Koh Lau.